When all the museums are closed and you're not ready to call it a day, head over to Hong Kong's lively Temple Street Night Market to borrows the bargain wares, and indulge in some of Hong Kong's delicious street eats. Temple Street Market opens every afternoon and is located between Temple Street and Jordan Road running on the west side of Nathan Road. At 2pm Temple Street is closed for traffic and hundreds of the vendors set up tables of merchandise that line the sidewalks. The shops behind the stalls are still open, and some of the vendors tables are actually just extensions of the shop they're in front of. Although the market opens officially at 2pm many of the vendors don't open until after 4:30pm, when the markets starts to get busy. This market is mostly known for budget men's apparel such as t-shirts, jeans, socks, and sneakers, as well as colorful toys, accessories, and souvenirs. There's usually a few vendors selling knock-off posters, art prints, watches, and bags and most of what you'll find here falls into the category of cheap crap you don't need, run-of the-mill stuff you'd find at any tourist market, but the draw of Temple Street is extremely low prices, so if there is something you want you'll get to flex your negotiation muscle. Locals will never pay full price for anything at the market, don't be afraid to ask for a discount, even if the vendor turns you down there will likely be another vendor a few stalls down selling the exact same thing for a cheaper price. Closer to the Jordan Road end of the market you'll find street performers as well as tarot card readers and palm readers trying to sell their mystical powers to tourists. The best thing about the Temple Street Market (or any market in our opinion) is the street food. 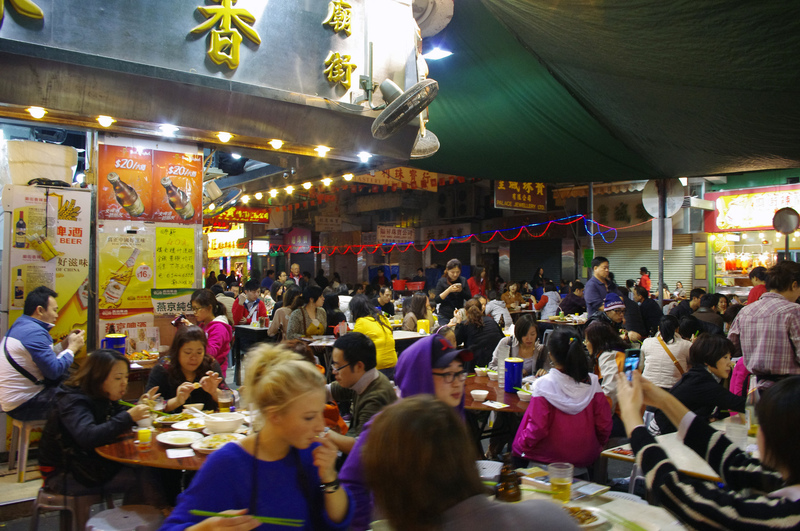 There are a number of dai pai dong's (open-air food stalls) located inside the Temple Street Market where you'll find a great range of Hong Kong best street vendors selling things like fried fish balls, Cantonese noodles, fried seafood, spicy tofu, stuffed dumplings, and roasted meats such as duck and pork. All these tasty treats can be had for just a few Hong Kong dollars, making this a fantastic way to try a lot of Asian dishes on a budget.